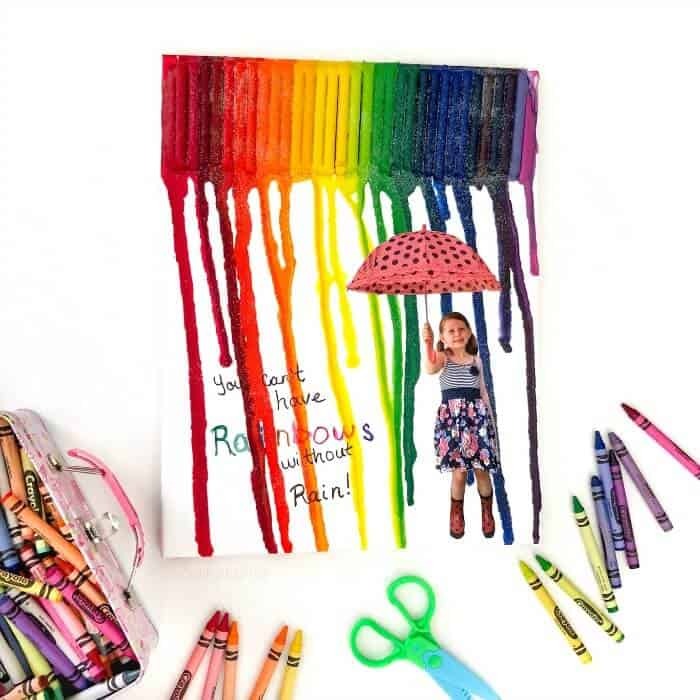 Rainbow DIY Melted Crayon Art Canvas Gift That Is So Cute It Will Make Them Cry! 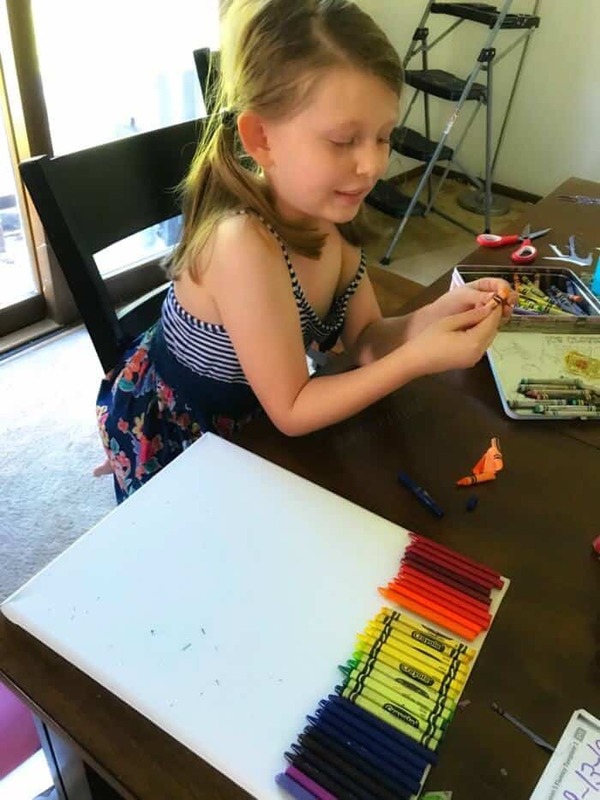 I feel like the most loved mama in the world when my husband made this adorable DIY rainbow melted crayon art on canvas. It was such a thoughtful gift from my daughter for my birthday and I about cried happy tears when I saw it. This would be a great gift for Christmas, Mother’s Day or a special birthday for any parent or grandparent! *This post may contain Amazon affiliate links to products we love. If you choose to purchase with the link we make a small commission at no extra cost to you. My husband Noel was kind enough to guest post and tell you all about how it made it! It’s not every day he pops in here, but here he goes! It was a special weekend at our house. My wife Kristy (who is normally your voice here at On My Kid’s Plate) was having a birthday, and one thing that is true for the kiddo and I is that we always try to make a cute and sentimental gift for these occasions. However, the pressure can feel really high to get it right when your wife is a blogger with a huge fan base around the world. But I also knew she would appreciate the effort. We’ve done some great DIY kids gifts in the past together and they always make great gifts. The kid loves to make crafts so it’s a great way to connect. We’ve had a hectic couple of months with moving, so I had to do something special. To keep the kiddo excited I needed this birthday DIY gift it to be a cool experience for the kiddo. After browsing online a bit, I was inspired by finding rainbow melted crayon art made out of leftover crayons. Our kid loves to color, so we used this as a way to recycle some old crayons and buy her a new 64-count Crayola box. We bought an 11×14 canvas and used our high-temp hot glue gun for this project. We started by picking out which crayons we wanted to use and making sure they lined up across the whole top of the canvas, and then we peeled them together. I attached the crayons with a high-temperature glue gun. I used the high-temp because I planned on melting the crayons in the oven. Hair dryers are often used, but I didn’t think it looked as nice or as much like rain as it could. I lined a baking tray (one with a lip!) with parchment paper and propped the top of the canvas up on an oven-safe pan. Please note! : the metal mixing bowl I used to prop it up cannot be used for food now that it has been used for a craft as wax dripped on it. So use an oven-safe bowl you don’t mind being melted on or pick up an inexpensive one like this one. You can also cover your bowl in tinfoil to keep the bowl from being covered in wax. I tried to cover the spot where I planned to put the picture with painters tape, but the crayon seemed to drip there anyways. If I was to do this again I’d just skip this step. I think it had to do with using the oven instead of using a hair dryer like some tutorials show. I preheated the oven to 200F, and the crayons started to melt a few minutes after it went in. The colors ran straight down, and some melted more than others, making a cute look. 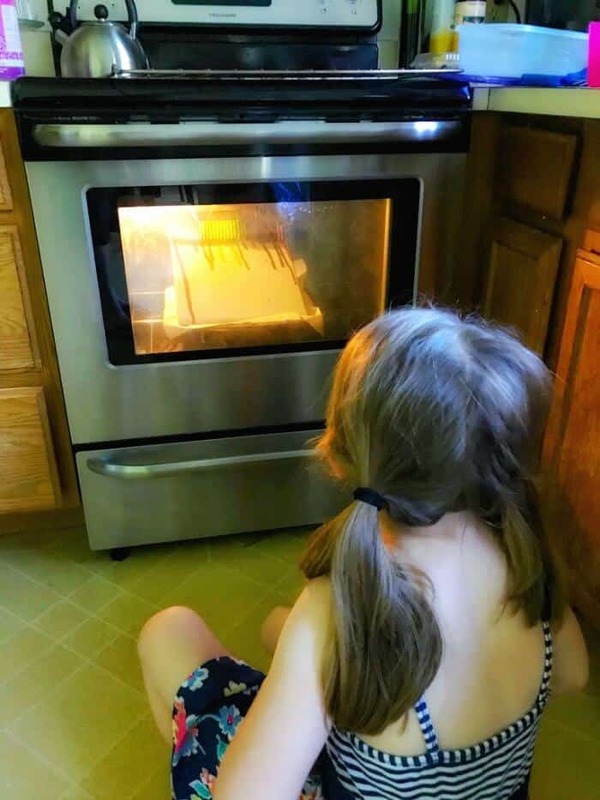 The kiddo was amazed and literally sat in front of the oven watching the crayons melt down the canvas. I pulled it out after two to four minutes or so when it looked nice, and placed it horizontally so it stopped dripping. The kiddo insisted on adding glitter to it to make it sparkle. Then it was time to work on the photo. I took a picture of the kiddo in rain boots and with an umbrella, and printed it as an 8×10. I carefully cut it out to only include her and her umbrella, and we glued the picture onto the canvas with the hot glue gun. 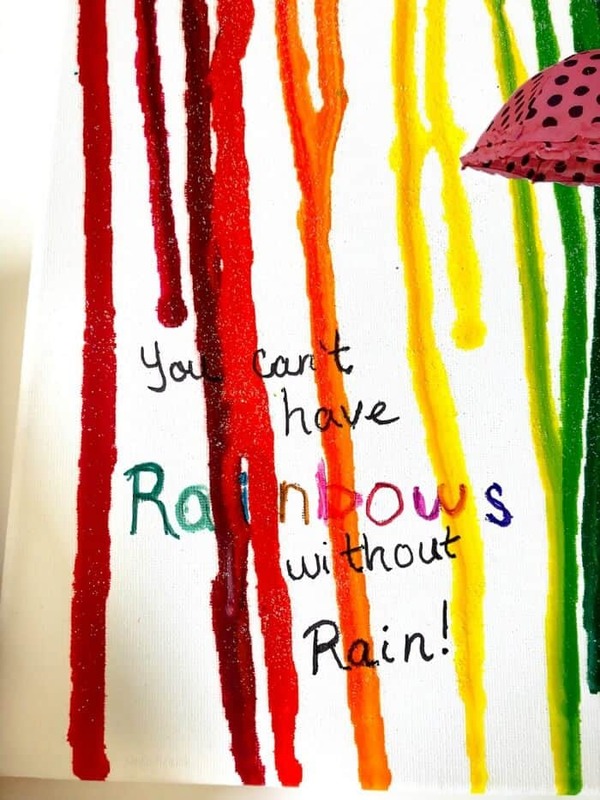 Then we finished the gift with a permanent marker to say “You can’t have RAINBOWS without Rain.” I was ok with the wax going over the words, but if you prefer you can write the words on a piece of cardstock and glue the cardstock to the canvas. Kiddo woke up early to give it to Kristy on her birthday and sing in her ear loudly, and Kristy loved it. This was a fun activity and would make a wonderful present for any occasion. Arrange your crayons (have your kid help) in a rainbow across the top of your canvas. The kid helped peel the papers off the crayons. Attach to the top of the canvas using a high-temperature glue gun. Lay parchment paper on top of your cookie sheet. Prop the canvas up at an angle on top of the bowl on the cookie sheet. Covering the bowl in tin foil will protect the bowl from wax. 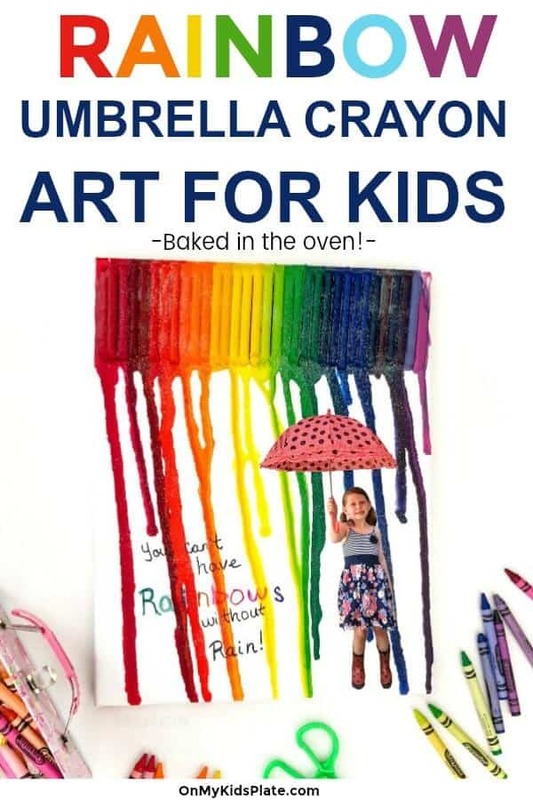 Put the canvas, pan, and bowl in the oven for 2-4 minutes or until the crayons begin to melt. Pull out of the oven and sprinkle with glitter if using. Allow canvas and wax to completely cool. Cut out photo of child with scissors, then glue to the now cool canvas. 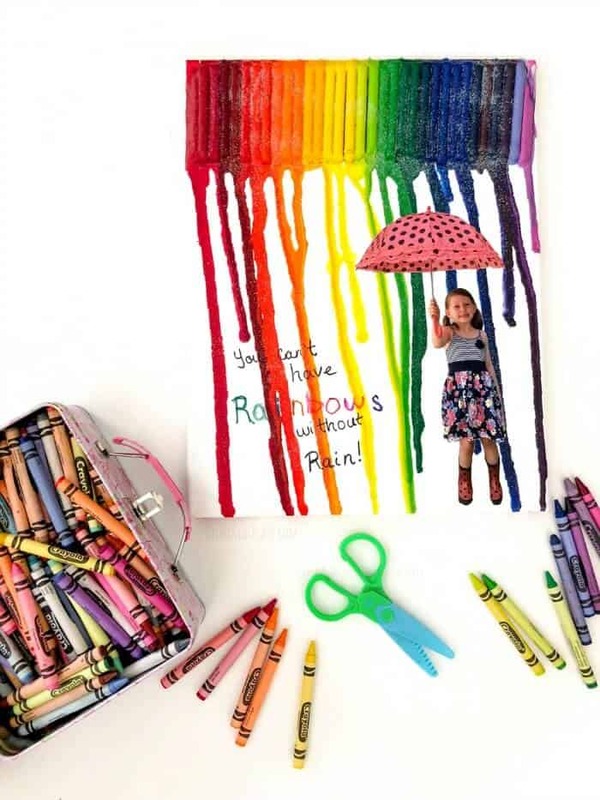 With a permanent marker write “You can’t have rainbows without rain.” Write the date on it, and admire your amazing gift! Thanks for having me everyone! I’m so grateful to Noel and the kiddo for this beautiful Rainbow DIY Canvas Art they made me as a gift for my birthday! 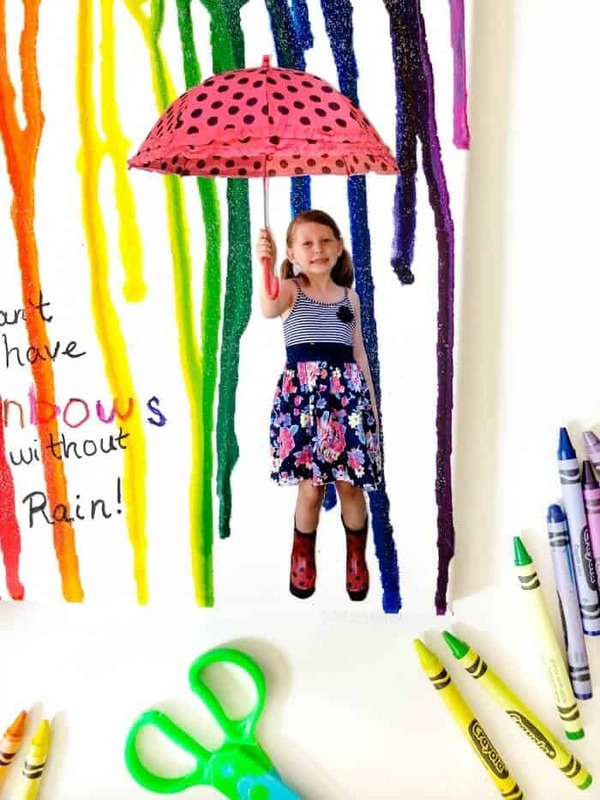 I was so surprised and touched that they took the time to make a beautiful rainbow DIY gift just for me, and I love that it has my kid’s picture right on it. It’s a keepsake I know I will cherish. Shh, don’t tell the family in case we make this DIY Canvas Art as a Christmas gift for them too! Drop your questions below, or share a time that you got a personalized gift you loved in the comments!